The £2.6bn Beatrice Offshore Windfarm Ltd (BOWL) project was given the green light for construction in May 2016 by owner’s SSE (40%), Copenhagen Infrastructure Partners (CIP) (35%) and Red Rock Power Limited (25%) after the project reached Financial Close. The project will be one of the largest private investments ever made in Scottish infrastructure. Scotland’s largest offshore wind farm has started generating power. 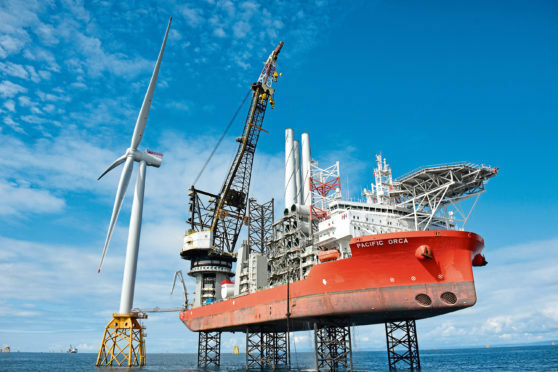 Following the installation of the first 7MW turbine, Beatrice Offshore Windfarm Ltd exported power to the National Grid for the first time yesterday. The installation of the first turbine heralds the start of the final stage of Beatrice’s journey towards completion in spring 2019. Once complete, Beatrice’s 84 Siemens Gamesa turbines will be capable of providing clean and sustainable power for the equivalent of 450,000 homes. Situated eight miles off the Caithness coast, the £2.6 billion wind farm is not only one of the largest private investments in Scottish infrastructure, it is also the largest offshore wind farm in the world built using jacket foundations. The jackets are the deepest water-fixed foundations of any offshore wind farm, each weighing in at around 1,000 tonnes and being installed in water depths of up to 56 metres. John Hill, Beatrice’s project director, said: “We often talk about key milestones along a project’s journey, and Beatrice has had quite a few to date, but to see the first turbine turning in the Moray Firth and to have reached first power safely, ahead of programme and on budget is a fantastic achievement for everyone connected to the project. “The project has already brought several benefits to the local community, the UK supply chain and, once completed, Beatrice will make a significant contribution to Scotland’s ambitious renewable energy targets. Scottish Energy Minister, Paul Wheelhouse MSP, said: “This is a very significant step forward and I am delighted to hear that the Beatrice offshore wind farm has generated its first power for the National Grid and has done so ahead of schedule. I congratulate the Beatrice team for achieving such an important milestone. “Once fully up and running the £2.6bn wind farm is expected to generate sufficient power to meet the needs of around 450,000 homes and to add £1.13bn to UK GDP and support more than 18,100 years of full-time employment across the UK. Beatrice Offshore Windfarm Ltd is a joint venture partnership between SSE (40%), Copenhagen Infrastructure Partners (35%) and Red Rock Power (25%).